What could coffee possibly have to do with climate change? Well, just about everything. 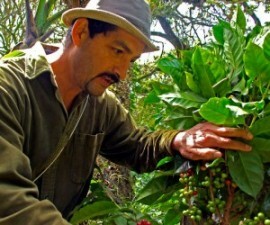 For decades coffee was Costa Rica’s biggest source of income, driving the transformation of hundreds of thousands of hectares of tropical forest into endless rows of coffee that require carbon-based fertilizers and pesticides. Oldemar Salazar worked the conventional plantations for years, but is now making peace with forests, biodiversity…as well as our taste buds. If you visit the beautiful Monteverde Cloud Forest while you are in Costa Rica, make sure to stop by Finca La Bella Tica and enjoy the best organic coffee in Costa Rica. Our fair trade organic coffee is shade grown, sustainably in harmony with its natural environment. We will be glad to show you every step of the production process. You are welcome to tour and even volunteer around here. Just get in touch with us! In the rush of our daily lives, it can be hard to recognize changes in the natural environment. Monteverde Now gives you access to place where change cannot be ignored – Costa Rica’s Monteverde Cloud Forest. It is a collection of 11 short films about people who live and work in one of our planet’s most diverse and delicate ecosystems. Monteverde Now is a Master’s research project conducted by the United Nations Mandated University for Peace and the Monteverde Institute.